Through Plan4Health, the Puyallup Watershed Initiative’s Active Transportation Community of Interest (AT COI) aimed to increase access to safe, healthy, and affordable active transportation options and to educate the community on health, equity, and active transportation. The Pierce County, Washington, portion of the Puyallup Watershed has a population of more than 400,000 and is characterized as more diverse, but with lower rates of education and lower median income when compared with the rest of the state. More than nine percent of families live below the poverty line and 14 percent do not carry health insurance. Pierce County ranked 21st out of 39 counties in Washington for overall health outcomes. Heart disease and cancer are two of the top causes of death, with rates higher than state averages. Obesity and smoking rates are also elevated, and African Americans experience poorer health outcomes compared with other races. 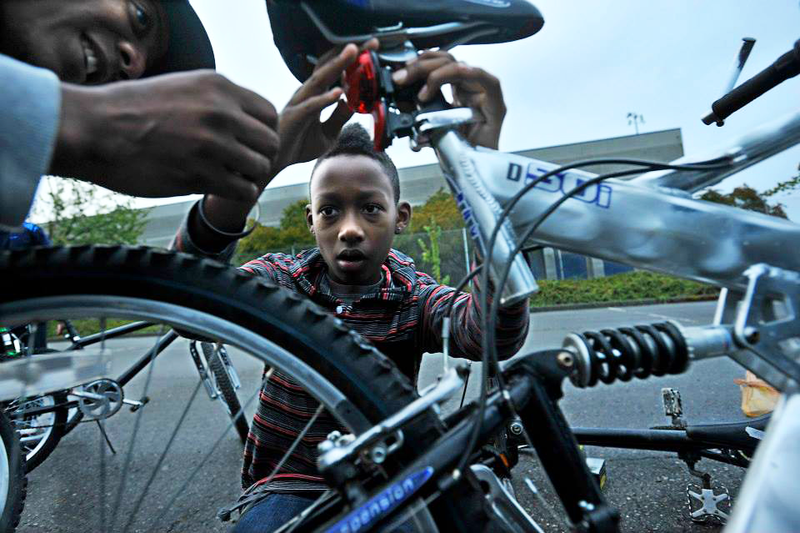 Students repair bikes in Pierce County, Washington. Photo courtesy Puyallup Watershed Initiative, Active Transportation Community of Interest. Pedestrian and bicycle safety are major concerns as well. Washington scored a 28.46 on the Pedestrian Danger Index, ranking it 36th nationally. Between 2013 and 2014, 16 deaths, 80 serious injuries, and hundreds of less severe crashes occurred in Pierce County. Every eight days a young person in Tacoma is struck by a car while walking or bicycling. As part of Plan4Health, the AT COI partnered with City of Tacoma and Tacoma Public Schools to build a comprehensive Safe Routes to School (SRTS) plan to develop strategies to support young people to safely walk and bike to and from school. Through this planning process, the AT COI helped raise the profile of this critical safety issue and engaged community members who wanted to help improve safe access to school. The unprecedented show of support by community members and local decision makers has led to measurable impact: in the City of Tacoma’s 2017–2018 budget Safe Routes to School was awarded $1.6 million, including $500,000 set aside specifically for the implementation of the new SRTS Plan. "The collaboration with the City of Tacoma, Tacoma School District administrators, parents, and committed stakeholders will result in a plan that fits Tacoma’s needs and the community can participate in and support." The SRTS planning process has provided the opportunity to strengthen relationships with the City of Tacoma and Tacoma Public School District. The AT COI will continue to work closely with the city, district, and other community stakeholders as the plan moves into the implementation phase. As a first step, partners are working to identify funding sources for different pieces of the plan and are currently applying for a grant to develop an active transportation curriculum. If awarded, this grant will fund local teachers to develop a curriculum that is tied to the Washington State K-12 Learning standards. This is the first step in bringing safety education to every student in the Tacoma Public School District. PWI: Active Transportation COI from Puyallup Watershed Initiative on Vimeo. This success story was developed in partnership with Liz Kaster, active transportation COI manager, Puyallup Watershed Initiative. Top image: Bicyclists in Pierce County, Washington. Photo courtesy Puyallup Watershed Initiative, Active Transportation Community of Interest. Elizabeth Hartig is project associate for APA's Planning and Community Health Center.